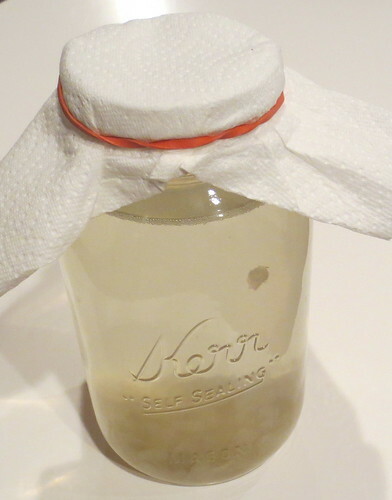 We have been enjoying homemade kefir water for some time now. Kefir water contains probiotics and has been found to help digestive issues and is a natural alternative to store-bought probotic products. I will share one of my recipes for the process here on My Useful Ideas. My recipe is very simple and it is easy to follow. First you need a yeast stater to make your kefir water. I obtained my starter from my DIL who has been making kefir water and had extra starter grains. Once you make kefir water you will find that your starters grow and you share them with other people. You can also purchase your starter grains from many different on-line sources. Make sure you use non-chlorinated water to make your kefir water. I am on a private water well which is not chlorinated and I just use the water from my tap and it works just fine. Here is a photo of my kefir water after one day of being covered and as you can see a few of the little kefir grains are floating which is a good sign. There are also little bubbles that confirm the grains are active and the process is working. I usually leave the glass jar covered with a paper towel for 2-3 days on my counter. I use a rubberband to keep the jar covered with the paper towel as shown. I check the kefir grains and if after 2 days they are floating and there are bubbles I then remove the grains. I added a small amount of apple juice to this batch to make apple kefir water. If your grains are not active and there is little bubbling going on, you may want to “feed” the grains more sugar. Add a tablespoon of additional natural pure cane sugar and stir gently with a plastic or wooden spoon. Don’t use a metal spoon or other metal objects when you make your kefir water as it can harm your kefir grains as metal can cause the grains to become less active. Now re-cover the jar with the paper towel and leave it to process for another 12-24 hours. Even if you kefir grains are not very active, you can still get some benefit from the kefir water as some probiotics will still be found in the drink. Combine water and 1/3 cup of sugar in the glass jar to half full to start. Stir to dissolve the sugar and then add 2 tablespoons of kefir starter grains to the jar. Stir gently a few times, fill jar the rest of the way full with water and cover with paper towel. Place rubberband around jar to secure the cover. Leave on the counter for 2-3 days. See tips above if your aren’t seeing bubbling. 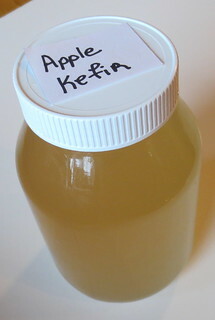 Once you remove the kefir grains and add a bit of apple juice, it’s time to seal the jar with a tight plastic lid. Leave the sealed jar on the counter for 2 more days. After this time, you can now put your kefir water in the refrigerator and enjoy drinking your homemade bubbly kefir water. For more on making kefir water and other recipe ideas, check out Wellness Mama’s kefir posts as I found them very useful and full of good tips for making kefir water.